Elizabeth Vassall was born in 1771 at Jamaica.2 She was the daughter of Richard Vassall and Mary Clark.1,3 She married, firstly, Sir Godfrey Webster, 4th Bt., son of Sir Godfrey Webster, 3rd Bt..1 She and Sir Godfrey Webster, 4th Bt. 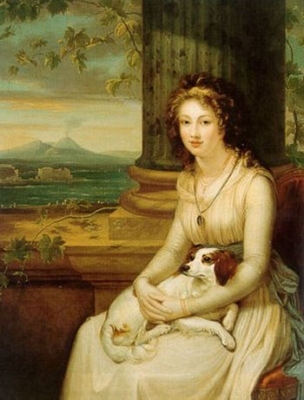 were divorced on account of her adultery with Henry Fox, 2nd Baron Holland.1 She married, secondly, Henry Richard Vassall Fox, 3rd Baron Holland of Foxley, son of Stephen Fox, 2nd Baron Holland of Foxley and Lady Mary FitzPatrick, on 6 July 1797.1 She died in November 1845 at London, EnglandG. Her married name became Webster.1 Her married name became Fox. Distant cousin of Isabella's first husband, also Richard Beauchamp. Child of Elizabeth Vassall and Sir Godfrey Webster, 4th Bt. Sir Thomas Faucomberge was the son of William de Neville, 1st and last Earl of Kent and Joan Fauconberge, Baroness Fauconberge.1 He died on 22 September 1471, beheaded.